We have collected some examples of the wide range of tours and opportunities in the neighbor of Recife. Take a look! On this tour, you will have, at one time, the best of Recife and Olinda. First of all, there will be a panoramic tour in Recife, including the three islands (Recife, Santo Amaro and Boa Vista), Mauricio de Nassau bridge and the Republic Square (where is located the Government Palace, Santa Isabel Theater and Justice Palace) and House of Culture, a building from the 19 century, used as a prison. Nowadays, presents itself as a representative center of the regional culture with craft shops and typical foods. In Olinda you will visit Alto da Sé, with the churches of Sé and Misericórdia. Olinda is considered a Cultural Heritage by UNESCO. In continuation, there is a visit at Cachaçaria Carvalheira, where you will be aware about the process of making and aging of the distillate, sugar and its derivatives. Final stop at Shopping Recife, the largest mall in the city. Note: Does not include meal, admission to museums, churches, etc. 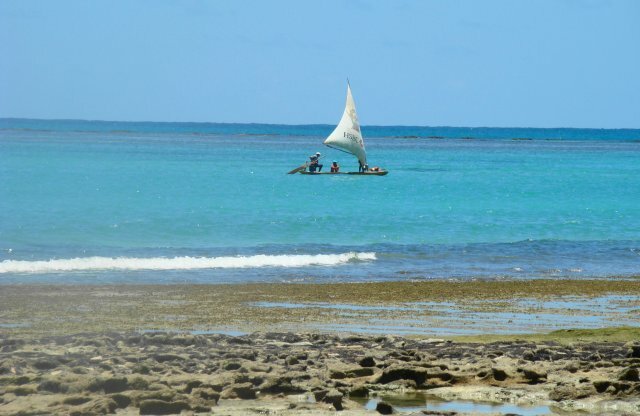 With crystal clear Waters of a sparkling blue, where you see small colorful fish and many other species, and huge palm trees, in Porto de Galinhas you can enjoy the most desired peacefulness of the genuine fishing village. In the nineteenth century it was a port for the clandestine slave trade and today is considered one of the most beautiful beaches in Brazil. Optional raft trips through the natural pools (subject to low tide) and buggy to the beaches of Pontal de Maracaípe and Muro Alto. Note: Does not include meal. Tourist attraction for those who appreciate nature. One of the most popular destinations in the north of Pernambuco coast, this island is known for its natural beauty and pleasant climate where you can enjoy a nice swim. Then stop in Itamaracá, with 84 kilometers of nature, history and beauty where the Fort Orange, built by the Dutch in the seventeenth century. Located on the southern coast, became known for its natural beauty, warm and crystal clear waters. In the past, were refuge of adventurers seeking peace in the small fishing village. Buggy ride through the beaches of the region (Cabo de Santo Agostinho and Calhetas) and catamaran ride through the beaches and also the mangroves. Carneiros Beach has a calm sea with ideal characteristics for a good swing, clear water. It is approximately 90 km in the south of Recife. Prepare to meet a ragged coastline of palm trees and white sand. 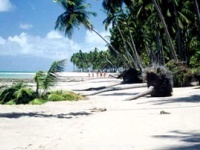 You will be delighted with the rudimentary and wild nature, an exotic and, unexplored and semi-desert beach.  For a private tour, please consult us. The hotels are old homes of residents who were reformed and adapted over the years to receive guests who wish to know Fernando de Noronha Archipelago. • Room Detail: private bathroom, TV, air conditioning, voltage 220V, hot shower, minibar, box bed. • All visitors and tourists are obliged, by Law No. 10,403 / 89, to pay the fee of Environmental Protection charged by the State of Pernambuco (www.noronha.pe.gov.br) of approximately R$ 51.40 per person/day. Additionally, there is the entry of access to Marine National Park ( on average 70% of the Archipelago ). The fee is R$ 162.00 for foreigners, for up to 10 days of lodging. • Hotel Will be confirmed upon 24 hours before the travel. Guests can be accommodated in one of these hotels: Brisamar, Alvorada, Arquipélagos, Carlinhos, Mano, Bita, Agulhão, Leide, Mércia, Corrente Maritima, pousada do Del, Allefawi, Floresta e Mar, Ousadia, Morro do Pico (Mano2), Pousada Casa de Neide, Oceano Azul, Ilha e mar, Atalaia, Romildo, Lopes, Solar do trinta, Mar Azul, Nêga, Netuno, Pedra do Mar, Lun Mar, Ocean Atlântica, Portal dos Golfinhos, São Silmares, etc. • Check Terms of Service. The hotels are old homes of residents who were reformed and adapted over the years to receive guests who dream to know Fernando de Noronha Archipelago. *Proposal subject to any changes without notice.